For other uses, see Borrowdale (disambiguation). Borrowdale is a valley and civil parish in the English Lake District in the Borough of Allerdale in Cumbria, England. It lies within the historic county boundaries of Cumberland. It is sometimes referred to as Cumberland Borrowdale to distinguish it from another Borrowdale in the historic county of Westmorland. Simon Jenkins rates the view of Borrowdale from Castle Crag looking towards Derwentwater as the number one best view in England. The valley rises in the central Lake District, and runs north carrying the River Derwent into the lake of Derwentwater. The waters of the river have their origins over a wide area of the central massif of the Lake District north of Esk Hause and Stake Pass. These origins include drains from the northern end of Scafell, Great End, the eastern side of the Dale Head massif, the western part of the Central Fells and all the Glaramara ridge. Near Rosthwaite the side valley of Langstrath joins the main valley from Seathwaite before the combined waters negotiate the narrow gap known as the Jaws of Borrowdale. Here it is flanked by the rocky crags of Castle Crag and Grange Fell. The valley then opens out around Grange before the river empties into Derwentwater, overlooked by Catbells, Skiddaw and Walla Crag. Most of the mountains at the head of Borrowdale, including Scafell Pike and Great Gable, are part of the Borrowdale Volcanic Group, a geological development from the Ordovician period. The B5289 road runs down the full length of the valley, and at the southern end crosses the Honister Pass to Buttermere. At the heart of the valley is the village of Rosthwaite. Some more Borrowdale villages include Stonethwaite, Seatoller, Seathwaite, and Grange. The civil parish of Borrowdale covers a considerable area around the valley, including the southern half of Derwent Water. It includes the settlements of Grange, Rosthwaite, Seathwaite, Seatoller, Stonethwaite and Watendlath. It lies entirely within the Lake District National Park. At the time of the 2001 census, the parish had a population of 438 people, living in 137 households. The 2011 Census showed that the population had declined to 417 residents among 128 households. 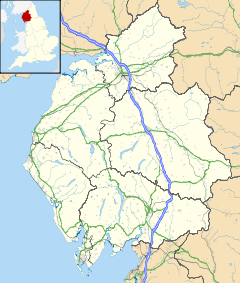 For local government purposes, the civil parish forms part of the district of Allerdale within the county of Cumbria. It is within the Workington constituency of the United Kingdom Parliament and the North West England constituency of the European Parliament. The valley is currently a tourist location with hotels, guesthouses, holiday cottages, bed and breakfasts, youth hostels and campsites. It caters to lowland visitors as well as hill-walkers. Sometime before 1565 (some sources say as early as 1500), a major deposit of graphite was discovered near the Seathwaite hamlet in Borrowdale parish. The locals found that it was useful for marking sheep. The graphite was pure and solid, and it could easily be sawed into sticks; the pencil industry was born in nearby Keswick. The graphite find remains unique. In the first of Sir Hugh Walpole's series of four novels Rogue Herries about the Herries family, Borrowdale is the site of a fictional house called Herries, the home of Francis Herries, the protagonist of the novel. Subsequent novels in the series are also largely set in Borrowdale. The valley and its surrounding mountains are described in sympathetic detail. Walpole himself had a house at Brackenburn, Manesty, overlooking Derwent Water from 1924 until his death in 1941. Hazel Bank Country House was the fictional home of Rogue Herries and birthplace of Judith Paris. Walpole was a friend of the Simpson family, who owned Hazel Bank. This is where Walpole found the inspiration for the "Herries Chronicles". ^ a b "Election Maps". Ordnance Survey. Retrieved 2 January 2010. ^ "Census 2001 : Parish Headcounts : Allerdale". Office for National Statistics. Retrieved 22 November 2009. ^ Martin Norgate & Jean Norgate (2008). "Old Cumbria Gazetteer, black lead mine, Seathwaite". Retrieved 19 May 2008. ^ Alfred Wainwright (2005). A Pictorial Guide to the Lakeland Fells, Western Fells. ISBN 978-0-7112-2460-5. ^ Parnell, J. (2009). "Genesis of the graphite deposit at Seathwaite in Borrowdale, Cumbria". Geological Magazine. 119 (5): 511. doi:10.1017/S0016756800026868. ^ Strens, R. G. J. (2009). "The Graphite Deposit of Seathwaite in Borrowdale, Cumberland". Geological Magazine. 102 (5): 393. doi:10.1017/S0016756800053668. ^ Weis, P; Friedman, I; Gleason, J (1981). "The origin of epigenetic graphite: evidence from isotopes". Geochimica et Cosmochimica Acta. 45 (12): 2325–2332. doi:10.1016/0016-7037(81)90086-7. ^ Ortega, L.; Millward, D.; Luque, F.J.; Barrenechea, J.F. ; Beyssac, O.; Huizenga, J.-M.; Rodas, M.; Clarke, S.M. (2010). "The graphite deposit at Borrowdale (UK): A catastrophic mineralizing event associated with Ordovician magmatism". Geochimica et Cosmochimica Acta. 74 (8): 2429–2449. doi:10.1016/j.gca.2010.01.020. ^ Barrenechea, J. F.; Luque, F. J.; Millward, D.; Ortega, L.; Beyssac, O.; Rodas, M. (2009). "Graphite morphologies from the Borrowdale deposit (NW England, UK): Raman and SIMS data". Contributions to Mineralogy and Petrology. 158: 37–51. doi:10.1007/s00410-008-0369-y. Wikimedia Commons has media related to Borrowdale. This page was last edited on 10 February 2019, at 12:57 (UTC).